While at Winter NAMM 2017, Rayco Resophonics was approached by Acoustic Guitar Magazine who wanted to do a review on one of our resophonics. We sent them our reserve grade quilted maple squareneck with all the premium appointments. Among other kind words they concluded, "The Rayco Squareneck Resophonic is one luxurious guitar." and "The Rayco has a warm and brilliant tone, drenched with harmonic color. It’s an impressively loud and lively instrument that almost sounds like multiple guitars played at once." 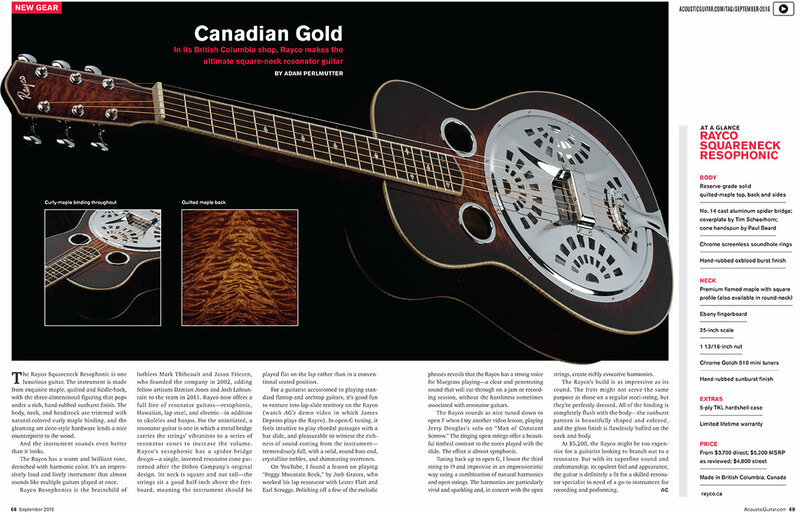 Acoustic Guitar Magazines review of our Rayco Squarneck Resophonic is available online and at the newsstand in the September issue of Acoustic Guitar Magazine. It is a gorgeous two page spread. We have included a preview photo or you can download the full review in pdf form (2.8mb).